Stroke. 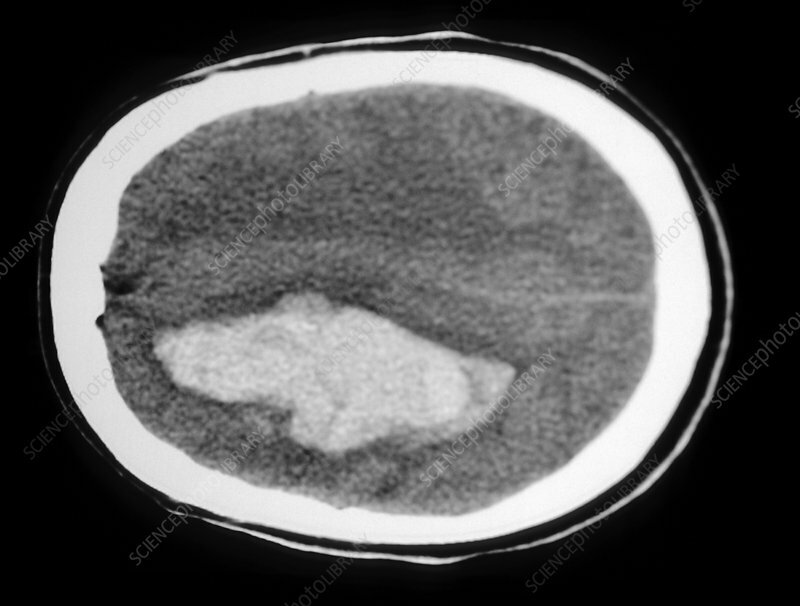 Computed tomography (CT) scan of the brain seen in axial section showing an area of internal bleeding (white), which has led to a stroke. This is the death of brain tissue due to an impaired blood (and therefore oxygen) supply. Strokes (or cerebrovascular accidents) are a major cause of death in developed countries. The bleeding (haemo- rrhaging) is usually brought on by hypertension (high blood pressure). Only a third of strokes are immediately fatal, but depending on the area of the brain affected, confusion, speech problems and paralysis may result in the long term. Therapy may help survivors live a near-normal life.